I have been doing a lot of baking with my boys, which meant that we were low on baking supplies. This of course meant a trip to ALDI, but I encountered two problems. First of all, ALDI had no cocoa! I don't know why this always happens when I run out, but I think I need to learn to pick up the ALDI cocoa powder, when I see it in stock, and not when I need it. Second, the sugar has now changed to 4 lbs instead of 5 lbs, and the price is the same. Thankfully, I discovered this before I went to check out, because an ALDI reader brought this to my attention a few weeks ago. Back then my ALDI store was still selling 5 lb bags of sugar, but no more. So, if you are in need of sugar, make sure to pick it up at Target this week for $2.75 for 5 lbs. The 4 lbs sugar is $2.88 at my South Florida ALDI store, which takes it off my bargain list. To make up for the two baking supplies issues, I was excited to see that my ALDI had eggs at $1.19 this week. If I could have fit more under the stroller, I would have picked up four packages of eggs. Space was limited though, but thankfully all eggs made it home safely. (Compared to the lowest prices at my other grocery stores.Check out the grocery price list for details). How did you do at ALDI this week? Is your ALDI now selling 4 lbs sugar or 5 lbs sugar, and is the price the same? This week's Florida Aldi produce prices is all about the fruit. I am especially thrilled to see apples on sale, since my oldest son eats a lot of apples. We have pineapples growing in the garden, so there is no need to buy pineapples...yeah! What produce do you want to get at Aldi this week? This week's weekly Aldi meat special is available Wednesday April 25. Tyson Fresh Chicken Fajita Kit 2.04 oz $6.99/lb. This week we have lost a lot of the Aldi price cuts, but the price cut on ALDI orange juice (check out my review) is still good, and a new price cut on fudge bars have appeared. This morning I made a quick stop at ALDI, but it was mainly to pick up my son's favorite oatmeal. I had a few produce items on my list as well, and then I spotted some candy on clearance at ALDI too. Yes, it might sound strange to buy my kids Easter bunnies after Easter....but I know they'll be excited with this reward. They did get an Easter bunny each for Easter, but it surely wasn't this big. So...once FCAT week is over, I think it time for a big movie night with some great treats. How did you do this week? Did you spot any ALDI clearance? Whether you are looking for great tasting onion rings (see my Aldi Onion Rings review here), or you are looking for something great for the garden Aldi has it this week. 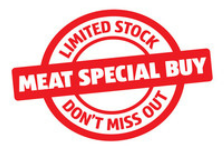 This week's weekly Aldi meat special is available Wednesday April 18. Costum Made Meals Fresh Stuffed Meatballs $4.49/lb. This week's Florida Aldi produce prices includes some great prices on produce, and I sure can't wait to fill up my produce drawer. I have not been buying tomatoes for a while though, since my garden is full of great tasting Florida tomatoes in all sizes...it doesn't get any more local than this. This week Aldi has a rare price cut on ALDI orange juice (check out my review), and although it is not much it is at least something. Otherwise all of the price cuts have been carried over from last week, and I noticed that my local South Florida Aldi store now has Aldi diapers at $4.99 as a regular price and not as a price cut. This week I decided to skip Walmart, and I only did a little bit of shopping at Publix, so I did the bulk of my grocery shopping at ALDI. My fridge and pantry was already filled to capacity, so I just needed the basis. Of course, I knew I had to pick up as much rye bread as my freezer could hold, because when ALDI has it on sale, it is less than half the price of what it would cost elsewhere. This week's Florida Aldi produce prices includes lots of great tasting produce, and I am amazed to see mangoes on the menu already. We have a mango tree full of mangoes in the backyard, but they certainly aren't ready yet, so this cannot be local mangoes. 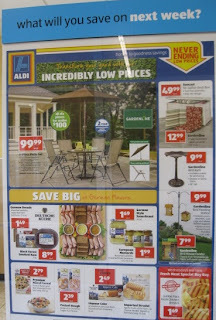 This week's weekly Aldi meat special is available Wednesday April 11. Jumbo Pack Fresh Chicken Breasts $1.69/lb. This week there we lost the diaper price cuts, but sour cream is still on sale and it is all about the Aldi granola bars. I did not need much from Aldi this week, as I did a lot of produce shopping last week by price matching at Walmart. I still needed to get oatmeal for my sons, and the price on carrots was just too good to pass. I usually end my shopping trip at ALDI, but this week I started it there, because I needed to get lactose free milk at Walmart. Since my shopping day is usually many hours long, I stuck to products that would not spoil by the South Florida heat, and I kept it all in my cooling bag while we were walking from store to store. My savings are calculated compared to the lowest prices at my regular grocery stores. You can check out the grocery price lists here. Did you get any great deals at Aldi this week? Aspen Valley Fresh Semi-Boneless Lamb Leg $5.99/lb.